The Pintail Kits include our 100% Canadian Hard Maple veneer, the key to making premium quality, long lasting decks. With this kit, you control the laminating process, using waterproof glue, the best skateboard veneer in the world and thousands of pounds of pressure. Make it right. Make it yourself! Select a pre-printed graphics sheet, or design and paint your own. 2 and 3 pack sizes available. By following the printed instructions included in the kit box, you will be guided through the glue up, stacking on the mold, inserting and sealing into the TAP bag. 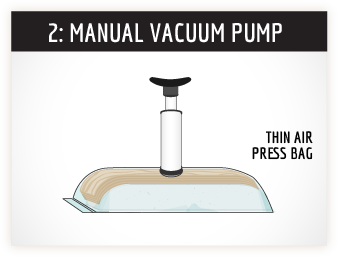 Using the manual vacuum pump to evacuate the air, the Thin Air Press will press the veneers over the mold. 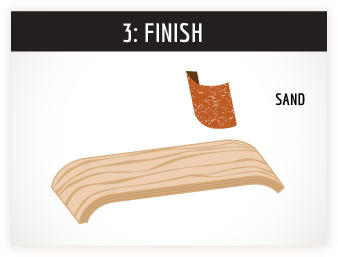 The sanding process is described, as well as some graphics suggestions. Q: Is this kit reusable? Q: What if my TAP bag or valve is leaking? A: 99.9% of the time, the seal is not closed up properly. Dust and debris can prevent the top cap of the valve to seal, rinse cap with water. For more in-depth details, see the TAP kit FAQ’s page. 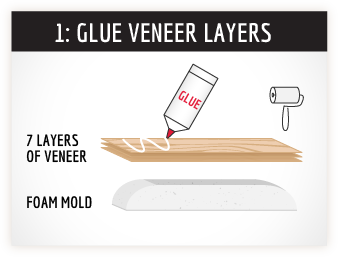 Q: Can I get more veneer? Q: Will stuff last if I don’t use it right away? A: Veneer will absorb and lose moisture, so keep it sealed in plastic (or the carton it arrived in) but away from any heat sources. Lay it flat to prevent warping. Prevent the glue from freezing. Q: Can I use this kit to make a snowboard or wake skates? A: The size of the bag determines how large a project you can fit into it. As the seams of the 14 x 47” TAP bag included here cannot be stretched open while pressing, you are limited to smaller projects. See our larger bag sizes for one that suits your project. Q: How do I get this cheaper? A: Become an entrepreneur! Each kit allows you to make more than one deck, build one for yourself and generate income from the other boards you build! A: A moisture protector is recommended (sponge on water-based outdoor clear coat) to seal all surfaces, especially your edges and before applying any graphics. If you choose to set this up for riding, select grip tape on this page. Shop locally for your hardware (wheels, trucks and bearings). Use the guide holes on the bottom side to drill the truck holes through, using a 3/16” drill bit. And of course, don’t forget to wear your helmet!